July 2008 Southern Skywatch up! The July edition of Southern Skywatch is now up. There are amazing planetary capers, comet Boattini, an occultation of Antares and the Aquariid meteor shower. Carnival of Space #60 is here. Carnival of Space #60 is up at Slacker Astronomy. There's space elevators, the Moon and ice on Mars, and lots more as usual. Amble over to Slacker Astronomy sometime soon for a look. Mercury and Alderbaran on Wednesday June 24 (click to enlarge). In the early morning Mercury is becoming quite prominent, and is in a beautiful location below Alderbaran and the Hyades in the eastern sky (you will need to enlarge the image to see the Hyades in this picture). While you are up, why not look for comet Boattini as well. On Monday morning (June 30) the crescent Moon, Alderbaran and Mercury form a nice triangle easily visible an hour before sunrise. Mars, Regulus and Saturn on June 28th (click to enlarge). In the early evening Mars, Regulus and Saturn are putting on a show above the Northwest horizon, and watching them over the next few days will be rewarding. The best time to watch is around one and a half hours after sunset. Mars then overtakes Regulus and heads for Saturn. 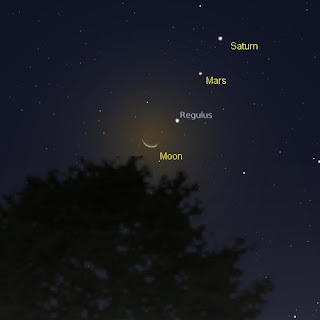 On Saturday July 6, the crescent Moon, Mars, Regulus and Saturn are in a spectacular line up. This line up would be a good subject for my Sketching the Sky competition, so why not get the pencils and paper out and have a go (see http://home.mira.net/%7Ereynella/skywatch/ for competition details). The ISS sailed past Mars and Saturn two nights ago, then zoomed through a crowded stretch of the Milky Way past Crux (the Southern Cross) and the Pointers. You are going to have to click on the images to enlarge them to see the full detail. The image to the left is ISS passing Mars (bottommost bright object), Regulus (middle bright object) and Saturn (top bright object). These three are forming pretty patterns at the moment (and keep an eye on them over the next few days). The ISS just adds to it. The image is that of the ISS passing Crux (the Southern Cross) and the Pointers (Alpha and Beta Centauri). 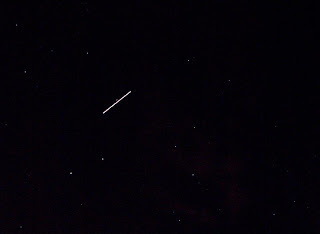 You really do have to click on this one to get a feel for the panalopy of stars the ISS was going through. The ISS was at its brightests at around this point. The animation is a little disappointing. To get it to a size that wouldn't choke blogger, I had to cut it down quite a bit, still you do get a feel for the ISS zipping past the planets from it. I love watching the patterns planets form in the sky. Close approaches of the Moon and bright planets are inherently beautiful, and provide a moving display against the predictability of the stellar backdrop. However, you can also see the planetary motion as a celestial clock. The movement of the planets is fairly precise (although over the millennia the tugs of gravity move them about a little), and no two planetary alignments are exactly alike. So in principle if you know what the sky looks like when a certain event occurs, you know when it occurs. A recent paper in the Proceeding of the National Academy of Sciences (read it for free here) used the sky pattens to date a central event of the ancient poem the Odyssey. In the poem a darkening of sky is used by a seer to predict the death of Penelope's suitors. Many people have interpreted this as an eclipse, but after much discussion, no one could agree what, if any, eclipse it refered to. Now two astronomers have identified the event as an eclipse on 16 April 1178, based on the patterns of planets and constellations mentioned in the Odyssey. The date agrees with the generally accepted time frame of the Trojan war,1192–1184 B.C.E. However, it also requires a bit of creative interpretation in some areas. 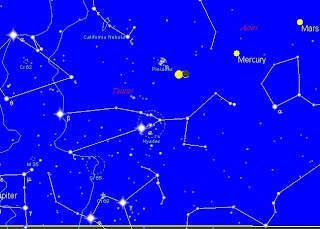 To find the locations of Mercury, the authors interpolate descriptions of the God Hermes travels as locations of Mercury in the sky. I'm a bit dubious about this step. Other positions (such as the location of certain constellations at sunset) are more clear, but overall I think it a bit of a reach. Still, it is a nice piece of detective work using the planets as a celestial clock, go have a read of the original paper, and have a look at the commentary in New Scientist and Science Daily. Finally, after many days, the sky was clera this morning. Cold, still, with only a little dew, ideal for morning star gazing. I had a quick look at Jupiter (a readily visible disk in binoculars, with Ganymede below it), then when hunting comet Boattini. 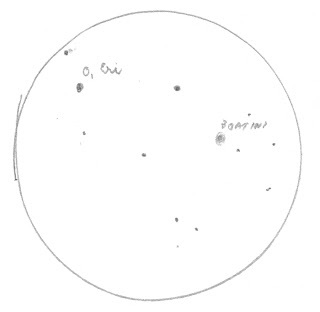 Boattini was readily visible in binoculars near omicron Eriandius (just up from Rigel). Couldn't see it with the unaided eye, but my eastern horizon is pretty grungy, due to the city being that way. No atil visible, but it did look pretty amongst the stars in the binoculars. 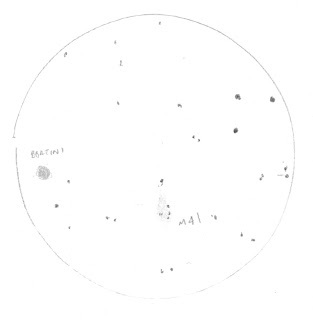 Tomorrow morning Boattini is near omicron1 Eri, so will be easily visible. I hope the weather holds. The eastern horizon in the southern hemisphere, around an hour before sunrise. While you are up looking at Comet Boattini, wait a little while and you can see Mercury rise above the mists of the horizon. 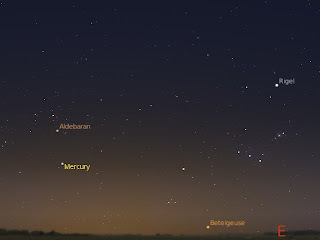 This is a very good time to see Mercury, not only is it rather high in the sky and easy to spot, but it is in very attractive territory, just below Alderbaran. Now if it were not solidly cloudy here. Well, the sky was covered in fog this morning, and looks like being clouded out tomorrow as well, so no morning Boattini for me. 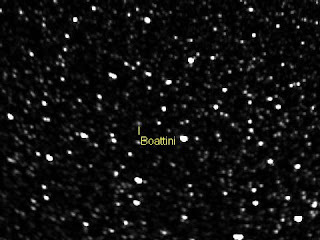 Still, I was able to see Boattini via the STEREO H2 imager. Boattini is a bit brighter in this image than it was in earlier image series from STEREO, but still no sign of a tail. Comet Al has some indication of tail structure in some of the images he has processed, but in the raw images, even when brightened to the limit, I can see no tail. The eastern horizon in the Southern hemisphere at around an hour and a half before sunrise (clcik to enlarge). 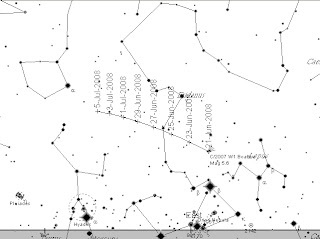 Comet 2007 W1 Boattini is now visible in the morning sky, at around magnitude 4.5-5. It is currently just above Rigel in Orion. Over the next few days the bright Moon may make it difficult to spot. A spotters map showing the eastern horizon an hour and a half before sunrise is here here. A more detailed map suitable for printing with the field of view of 10x50 binoculars indicated by a circle is here. Use the spotters map to locate the general area of the comet, then the detailed map to make sense of what you are seeing in binoculars. That title should be sung to the tune of the David Bowie song "Life on Mars". Anyway, Phoenix has uncovered some white shiny stuff that looks a bit like ice, and it sublimates (watch the animation at Dynamics of cats), so ice is looking good at the moment. Carnival of Space #59 is here. Carnival of Space #59 is now up at Green Gabbro. 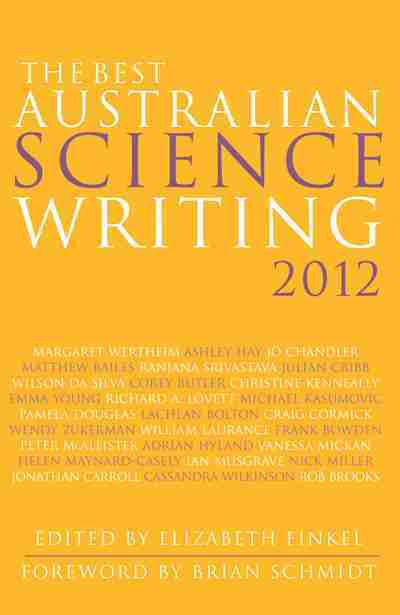 Plutinoids, Mars rovers, reflections on us as Aliens, extrasolar planets by the dozen and much, much more. Rock on over and have a look. 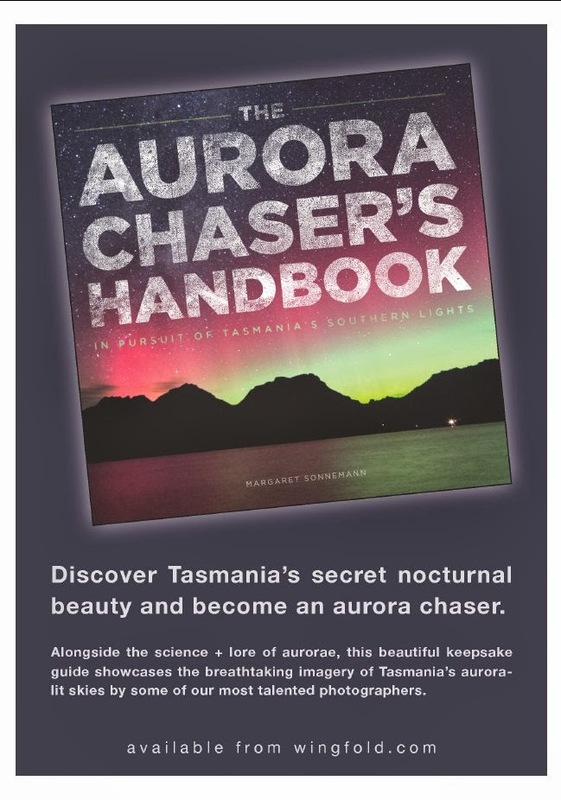 If you are in the broadcast region of ABC Ballarat, then have a listen this Monday morning (June 16) around 10:30 am or so, I'll be talking about Southern Skywatch and things astronomical for around 10 minutes. Carnival of Space #58 is here. Carnival of Space #58 is now up at Universe Today. There are tips for starting astronomy, more on the Phoenix lander, discussion of Plutinoids, growing Bamboo in space and lots lots more. Launch yourself over there now. Best Moon Halo Shot Yet! Tony Travaglia has been plauged, or blessed, with thing high cloud. This has resulted in a series of amazing Moon Halo shots. But this one, this one is the best. Look at those colours! Canon 40 D ISO 400 exposure 15 sec @ f3.5, untouched save for the levels which he evened out. 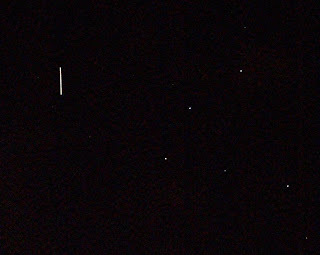 The ISS shoots through the pointers (alpha and beta Centauri), if you squint real hard, you can maybe make out the shuttle behind it. Or it may be imagination. The ISS and shuttle pair were clear enough to the unaided eye, the shuttle much dimmer, as they paraded through the sky in the dawn. An awe inspiring sight. View of the Southern horizon as seen from Adelaide at 6:40 am, June 12, with the track of the ISS and Shuttle (clock to enlarge). 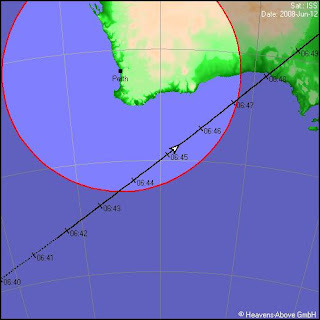 If you are living in Western Australia, Adelaide and parts south, Melbourne (and parts South) and Tasmania you will have the opportunity to see the ISS pass above the horizon with the space shuttle close behind. You have to get up around 6 am on Thursday June 12 to see this, and it is close to twilight, but it should be interesting to see the Space Station and the shuttle close together. The other bad news is that they are close to the horizon (except in Hobart). 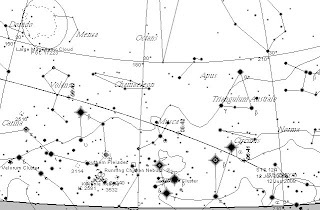 In Adelaide the pass starts at 6:41 am, passing by the pointers above the Southern Cross. In Hobart the pass starts at 6:49 am, starting in the tail of Scorpio then zooming past Achernar. In Melbourne the pass starts at 5:50 am, just below Canopus. 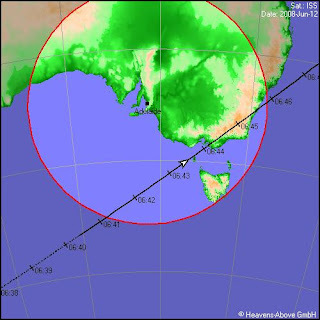 The map to the left shows the track of the ISS with respect to visibility in Eastern Australia, the map below shows visibility in Western Australia. 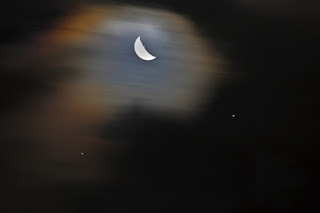 Reader Tony Travaglia sent in this lovely shot of the Moon, Saturn and Regulus and thin cloud with a clolourful halo around the Moon. Magic! Captured on a Cannon with 10 sec exposure 400 ISO @f3.5. Moon, planets and fish and chips. The Moon, Regulus, Saturn and Mars. Saturn is below right of the Moon, Mars is bottom left (click on the image to enlarge it). After the bushwalk mentioned in the Boattini post, it was my job to pick up the fish and chips. While waiting for the aforesaid fish and chips to be cooked, I wandered outside and took the following image of the Moon, Saturn and Regulus conjunction using my portable mini-tripod and a picnic table. We've been having more rain here over the past few days, so my views of comet Boattini have been limited. Today though it cleared up, and we went bushwalking. Got home in time for a fish and chip supper (great way to end the day after all that healthy exercise), then rushed out to quickly view Boattini in my 10x50 binouclars. It looked gorgeous next to M41, and I had just enough time to do this quick sketch before the whole lot went behind the neighbours house. Boattini's brightening has slowed considerably, so it's looked much the same for the past few days. It still is pretty symmetrical, no sign of a tail. In the coming days it will get harder to see as it heads towards the horizon and twilight. Reader Tony Travaglia from Oamaru, New Zealand, has sent in this fantastic image of a halo around the Moon (click on the image for a larger version). He was testing out a new lens, a Cannon 70-200 f2.8 zoom lens attached to a Canon 40D, 1.5 sec exposure and 400 ISO. The results are amazing, the colours are clear and bright, and the Moon is hardly over exposed. I look forward to seeing more images from Tony with this new lens. Carnival of Space #57 is here. Carnival of Space #57 is now up at Out of the Cradle. This Carnivals theme is women in space, in it you will find women in space, conferences on space, moving big space rocks, the Phoenix lander (of course) and lost lots more. Head on over and have a read. The northwestern evening sky at 8:00 pm local time. Over the weekend there will be some delightful patterns of planets and the Moon. 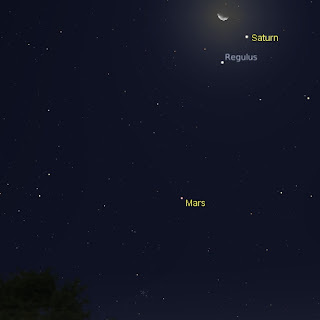 On June 8, Mars is close to the crescent Moon, and on June 9, Regulus, Saturn and the Moon make a nice triangle. They will be a good excuse to go out and look for comet Boattini. Have a look at this amazing video of an occultation of an 11th magnitude star by the asteroid 618 Elfriede. On the 23rd of May the SOHO and STEREO spacecraft picked up a Kreutz comet on its kamikaze dive into the Sun. Kreutz comets are a family of comets that are remnants of a disrupted large body whose orbits take them close to the Sun. 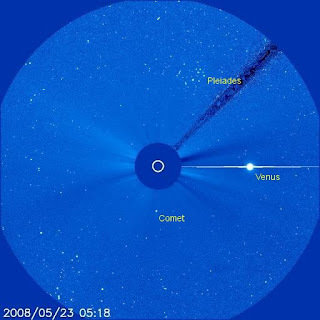 Since the launch of SOHO, many of these comets have been picked up by the SOHO coronagraph. For many Kreutz comets, when we catch their trip to the Sun is their last. The animation below (hand rolled from SOHO C3 images) shows the comet as it disappears behind the occulting disk of the LASCO C3 camera. The comet did not come out again. The SOHO pick of the day site also has images and videos of the plunge as seen through the C2 camera (more close up and a bit more dramatic than my Bloggerified video), and the STEREO site has images and videos of the plunging through the COR2 coronagraph. Note also the Pleiades and Venus passing each other by. A very nice conjunction, accompanied by comet. It's Medical Research Week! The Australian Society for Medical Research is putting on a weeks worth of research related activities. I'm involved in a session on aging at the conference tomorrow, but there are activities for the general public too. Here is South Australia and ex-student of mine will be organising a tour of outback schools showcasing a whole range of science, and there is a Science in the Cinema session on Sunday June 8 (2-6 pm) with the movie Eon Flux. So why not come along to Science in the Cinema? Boattini was gorgeous near M93. Sadly, as I've misplaced my headband that I use for the red-light torch, I had to juggle glasses, binoculars, sketch pad and lights while trying to sketch it, so it's not the best sketch I've done (and the scanner is pretty awful with pencil drawings). However, it does capture the essential elements of the view. I was hoping to see if I could catch Boattini's movement, but the clouds poured in, and that was that. Comet Boattini passes some nice open clusters as it hurries through Canis Major, and will look rather beautiful over the next few days. 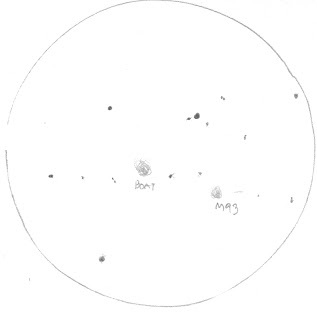 Tonight (June 3) Boattini is close to magnitude 6 M93, on June 8 it is close to open cluster Cr 121, and on June 9 it is close to magnitude 4.5 M41. This will be marvellous to follow in binoculars. Southen Skywatch June 2008 edition is now up. 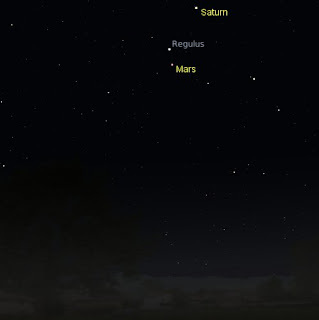 Mars, Regulus and Saturn line up on June 25th. 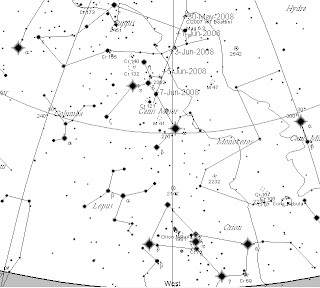 Southern Skywatch for June 2008 is now up. There is more comet Boattini, a nice line up of the Moon, Regulus and Saturn and some interesting patterns of Jupiter's Moons.